The six tapes in this remarkable and beautifully produced video anatomy atlas explore the fundamental structures of the Musculoskeletal System, the Head and Neck, and the Internal Organs. Tape 1: The Upper Extremity Tape 2: The Lower Extremity Tape 3: The Trunk Tapes 4 and 5: The Head and Neck Tape 6: The Internal Organs The Tapes show you true images of real, exquisitely dissected human anatomical specimens, in three dimensions. As the camera moves from one viewpoint to another, the specimen appears to rotate in space, letting the viewer experience it as a three dimensional object. Acland's Video Atlas uses fresh, unembalmed specimens that retain the color, texture, mobility--and beauty--of the living human body. A concise synchronized narration runs throughout the video. As each new structure is shown, its name appears on the screen. There is a self-testing feature at the end of each section. A visible time signal shows where you are in the program. The reference booklet gives you both an alphabetic and a chronologic index, with time locations for each structure. 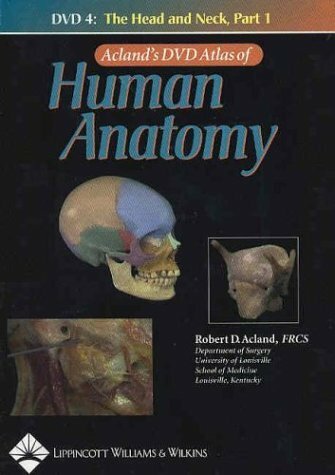 For students, Acland's Video Atlas is a time-saving aid to first-time learning, an effective way to relearn anatomy for clinical rotations, and a time-efficient tool for review at test time. For clinicians in training and in practice it assures a swift renewal of anatomic knowledge. For teachers Acland's Video Atlas shortens the time needed to provide immediate, satisfying explanations of three-dimensional structure. Lippincott Williams Wilkins gratefully acknowledges the support of Jewish Hospital Foundation, Alliant Health System, and United States Surgical Corporation in the production of the videos. Contact hours: 4. 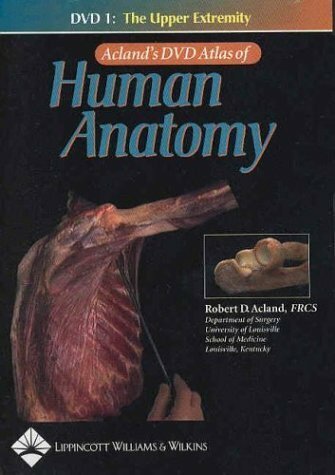 The first DVD in this remarkable and beautifully produced DVD anatomy atlas explores the fundamental structures of the Upper Extremity. 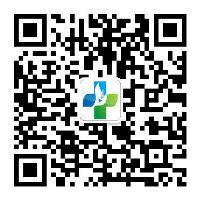 DVD 1 consists of three sections, describing The Shoulder; The Arm and Forearm; and The Hand. 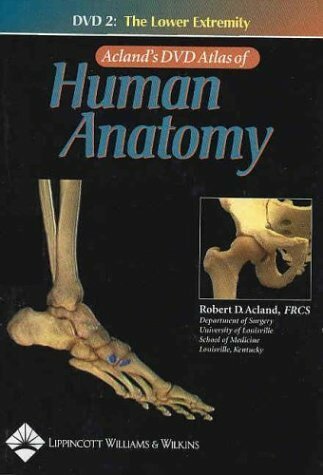 The second DVD in this remarkable and beautifully produced DVD anatomy atlas explores the fundamental structures of the Lower Extremity. 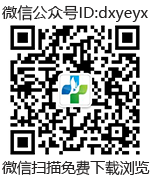 DVD 2 consists of four sections, describing The Hip; The Knee; The Leg and Ankle; and The Foot. 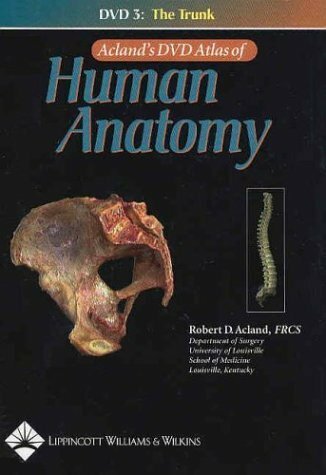 The third DVD in this remarkable and beautifully produced DVD anatomy atlas explores the fundamental structures of the Trunk. DVD 3 consists of four sections, describing the musculoskeletal aspects of The Spine; The Thorax; The Abdomen; and The Pelvis. 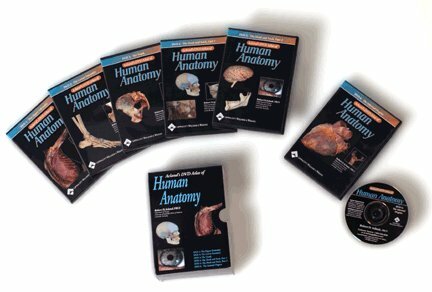 The fourth DVD in this remarkable and beautifully produced DVD anatomy atlas is the first of two DVDs that explore the fundamental structures of the Head and Neck. DVD 4 consists of five sections, describing support and movement of the head; the skull and facial skeleton; the nasal cavity and its surroundings; the oral cavity and its surroundings; and the larynx and its surroundings. 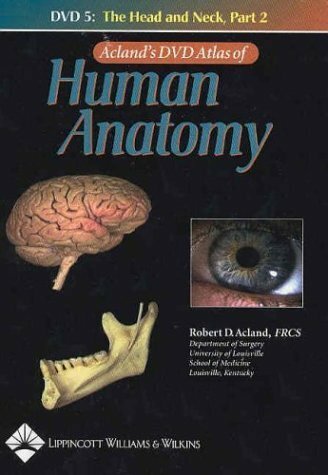 The fifth DVD in this remarkable and beautifully produced DVD anatomy atlas is the second of two DVDs that explore the fundamental structures of the Head and Neck. DVD 5 consists of six sections, describing the face and scalp; the brain and its surroundings; the blood vessels of the head and neck; the cranial nerves; the eye; and the ear. 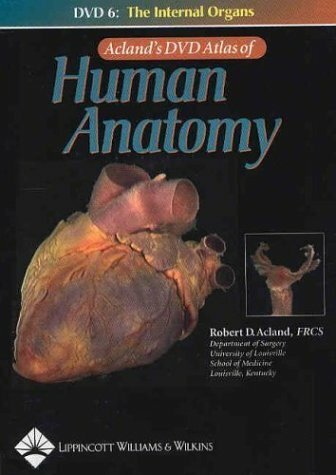 This DVD features the thoracic, abdominal, and reproductive organs. Each organ is shown in its natural location as well as in isolation, using a technique which enables the viewer to see organs as if they were weightlessly suspended in space, allowing a 360-degree view of the true shape of the structure without the distorting effects of gravity. Shots show the outer surface of the organs as well as cut-aways that present internal structure. DVD 6 consists of sections describing the thoracic organs; the abdominal organs; and the reproductive system.